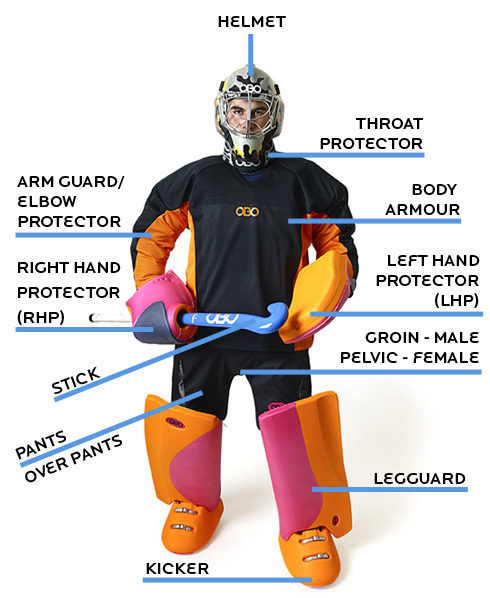 Hockey Goalkeeping Essentials – All Hockey Goalkeepers need to be fully protected. At ED Sports we sell a selection of top brand Hockey Goalkeeping Equipment. For expert advice please drop in to our shop. Special Packs and discounts to Schools and Clubs. Helmet – Wearing a Helmet has to be a top priority for any Hockey Goalkeeper. Helmets are made of a tough polycarbon shell and come with a faceguard attached. Throat protector – This protects the Adam’s apple. The bib extends from the wrap around to offer sternum and collar bone protection. It wraps around the throat and is secured by a velcro fastening to ensure that the throat is always protected. Arm & Elbow Guards – these are very sturdy and flexible, they offer good protection in all the places you want it – including the inner arm. Body Armour – This covers your chest, shoulders and abdomen. The lower section closely wraps around the chest and ribs, while the upper section floats over it protecting the clavicles and shoulders. The upper section of the body armour closely follows the body movement of the arms and shoulders, whilst the lower section chest stays firmly in place. The body armour protects at all times without sacrificing movement and agility. Hand Protectors – Hockey Goalkeepers often have to stop or block shots with the palms of their hands so protection here is very important. The blocking glove usually the left one will be heavily padded on the palm and back of the hand. The other which is used to hold the stick offers protection ie padding to the thumb and fingers. Goalkeeping Stick – Special Curved blade to give maximum stopping area. Padded Shorts\Abdo Guards – used to protect the tops of the thighs and the groin\pelvic area. Legguards & Kickers – Hockey Goalkeepers wear pads over their legs and as they use their feet to stop and kick the hockey balls they need to wear foot protectors(Kickers) which are strapped over their hockey shoes.